There may be no whiter genre than the costume drama. The flowing gowns, the horse-drawn carriages, the codes of aristocratic courtship all evoke an era not exactly known for diversity, the Associated Press reports. That’s why the simple poster of “Belle,” a new film directed by Amma Asante, is so striking. A beautiful, finely outfitted black woman in an 18th century parlor room stares back with regal poise. The historical incongruity is all the more arresting because, it turns out, it’s real history. “Belle” is the based-on-a-true-story of an 18th century mixed-race woman, Dido Elizabeth Belle (Gugu Mbatha-Raw), brought up in British aristocracy. While such a tale is undoubtedly rich, filled with questions of identity, class and race, “Belle” is unnaturally rendered like a Jane Austen story of dowries and engagements. It’s an awkward, ill-fitting match of social progress and costume drama convention. And those 18th century conventions of speech and etiquette are often gratingly stilted in “Belle,” stifling the film of any naturalism. Instead, “Belle,” made with fine intentions, has none of the uniqueness of its remarkable subject. 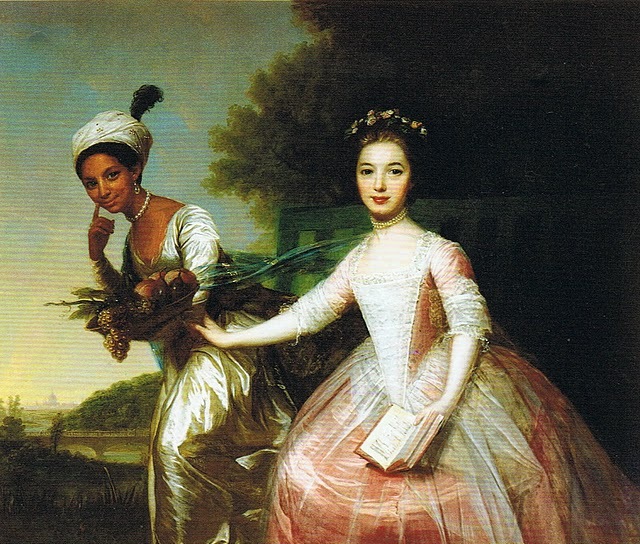 “Belle,” written by Misan Sagay, was inspired by a 1779 double portrait of Belle and Lady Elizabeth Murray — one biracial, the other white — captured in seeming friendship. Sagay and Asante (who’s made one film before, 2004’s “Way of Life”) were intrigued by the story behind the painting. Little, though, is known of Belle, so the film often feels as though it’s grasping to imagine what her life was like, and to artificially connect her with larger story lines from her time. “Belle” begins with her Royal Navy Admiral father (Matthew Goode, whose presence is missed as soon as he departs, setting sail for the Indies) dropping a young Belle off with his uncle, William Murray, the Earl of Mansfield (Tom Wilkinson) and his wife (Emily Watson) at their palatial country estate in Hampstead. They are initially appalled, but give in to his insistence that the illegitimate Belle has his blood, and should be raised accordingly. The film shifts to Belle and Lady Elizabeth Murray (Sarah Gadon) as young women. They are beginning to see society and possible suitors, though Belle is largely naive to her lesser status. When guest come for dinner, she isn’t allowed at the table. But Belle still has currency as a bride thanks to her lineage and her inheritance. As suitors circle each girl (Murray has no such dowry to offer), the movie empathetically comments on the variety of unjust inequalities, whether by skin color or gender, pocket book or standing. Belle is drawn to the idealistic son of a vicar (a low station) named John Davinier (Sam Reid). “Belle” also works in a famous event, the 1781 Zong massacre, in which a British slave ship drowned some 142 slaves in the Caribbean. The traders claimed to not have enough water for the voyage and made an insurance claim on the lost “cargo” that went to the height of Britain’s courts. William Murray, also Lord Chief Justice, oversaw the case, and the increasingly politically aware Belle — in a real stretch — is depicted as centrally influencing its decision. In a film populated by one-dimensional shades of good and evil, Wilkinson is the only actor called on to balance more than one emotion. As usual, he manages the task very well, adding a depth “Belle” otherwise lacks. That isn’t to say that the young British actor Mbatha-Raw doesn’t carry herself well. She is spirited and bright, alternatively gentle and impassioned. But the golden-hued “Belle,” handsomely made with lavish period detail, has none of the charged friction of its poster. “Belle,” a Fox Searchlight release, is rated PG by the Motion Picture Association of America for “thematic elements, some language and brief smoking images.” Running time: 104 minutes. Two stars out of four.